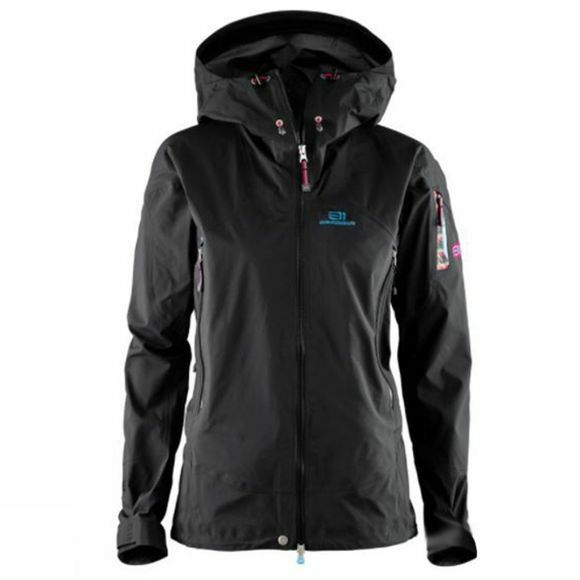 The Bec de Rosses Jacket is an all-seam sealed, three-layer shell jacket made from Gore-Tex Pro. This fabric will make a big difference when ski touring or taking part in other physical activities. The Bec de Rosses Jacket has an excellent fit allowing plenty of movement and is perfect for skiers who want to easily adjust their warmth using a layering system. It has a unique cut for a ski jacket; the idea comes from wet suits designed for surfing and gives excellent freedom of movement. With its superb fit and well-thought-through details it is a favourite for both mechanized off-piste skiing and ski touring in the mountains. All-seam sealed three-layer Gore-Tex Pro. Fully adjustable, fixed storm hood that fits over a ski helmet. Extra high front collar with brushed tricot on the inside. Ventilation holes in the inner placket. Large storage pockets, strategically placed, with a goggle cloth. Top stitching at critical seams to increase durability. Detachable powder skirt with snap-to-pant system and anti-slip elastic. Armpit ventilation with two-way zippers. Anatomically shaped wide cuffs to fit over gloves. Earphone compatible, zippered inner pocket.